The new products will officially be available on the MFT online store on September 5th at 9:00 pm EST (= Europe: September 6th at 3:00 am CET). 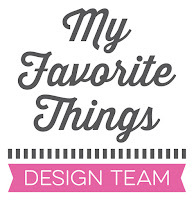 Most of the supplies I used for this project are linked in the list at the bottom of this post. The squirrel is so so sweet and he looks funny! I couldn’t resist and decided to focus on him. I created a scene using patterned paper for the background. I chose design paper from the Plaid Patterns paper pack. The grassy border was cut with a die from the Spring Scene Builder Die-namics set. I used Gumdrop Green cardstock. The old wooden stump is from the Birdie Brown Happy Hedgehogs set. The card base was made from Sno Cone cardstock. The stitched panel was die-cut using the Inside & Out Stitched Square STAX Die-namics. Such a cute scene and I love the plaid patterned papers in the background! Really sweet card, Francine! Such a cute card, I love this Woodland animal set! Another great stamp set from MFT! A great belated card that would make anyone happy! Love the colors and the plaid paper. Great card! LOVE THE PLAID, ADORABLE CARD. Absolutely adorable with great coloring job ! 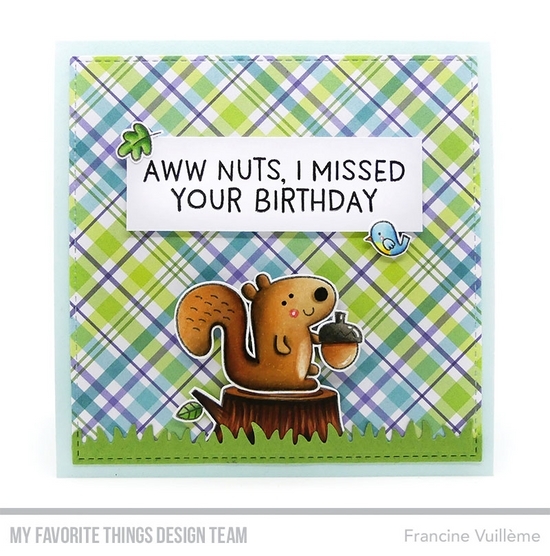 The perfect sentiment for the perfect squirrely card! Makes receiving a belated birthday card worth it!